The puzzle of mysterious stone heads that were left outside homes across Yorkshire in the dead of night appears to have been solved. 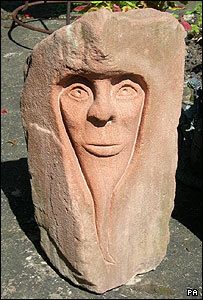 The sculptures are estimated to be worth between £200 and £500 each. A dozen appeared in North Yorks, four in Arthington, West Yorks and three in Braithwell in South Yorks. Now it has emerged sculptor Billy Johnstone from South Elmsall, near Pontefract, West Yorks, left them as a gift to whoever found the works. Each of the heads, which are up to a foot tall, looks different but all feature the same carving - which appears to spell out the word "paradox" - and a note bearing the riddle: "Twinkle twinkle like a star does love blaze less from afar?" The villages they have been found in are up to 50 miles from each other. But a search of a website called One to One Productions showed the works are the output of artist Billy Johnstone. A spokesman for the website said Mr Johnstone was out of the country, could not be contacted and was staying in a tent. However, Liz White, who is a director of the Art House, an organisation he is connected to, told BBC News she had asked him about the carvings. "I spoke to him a couple of weeks ago when the heads first started appearing and people got in touch with us to find out about them," she said. "He says that he wants people to do what they want with them, take them in, leave them there, give them away, whatever they want to do with them." "There are only so many galleries and only so much work that can go in. "But if you think about the people that have seen the work over the last two or three weeks, the sort of people who are seeing it are the sort of people often perhaps who wouldn't go into galleries." She said he contacted the Art House last weekend and told her 57 heads had been left across the north of England. "They're gifts for the people who find them, part of an on-going art project and not a publicity stunt," Ms White said he told her.